Courtyard Madison West/Middleton is one of the most convenient Madison hotels located on the city's west side in Middleton, WI. This Diamond Award-winning hotel in Middleton, is one of the top 10% Courtyard hotels in the world. 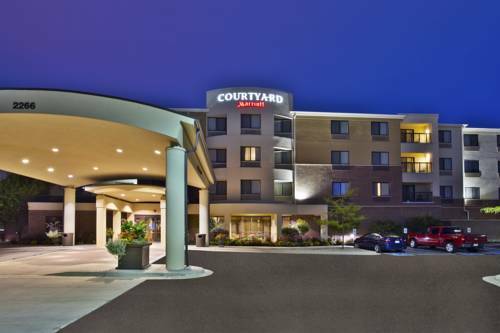 As one of the perfect hotels near downtown Madison for business or leisure, we are just minutes from Greenway Station, University of Wisconsin, Kohl Center, Alliant Energy Center and Madison's new Overture Center for the Arts. Ideal among Madison West hotels, we are near major companies, such as American Girl, Epic Systems, CUNA Mutual, Fiskars, Electronic Theatre Controls, Mead & Hunt, Spectrum Brands and Springs Window Fashions. Enjoy complimentary wireless and wired high-speed Internet access in every guest room and throughout the hotel's public spaces. Wake up to a delicious breakfast at the Bistro restaurant. In the evening, sink into a comfortable chair while enjoying a dinner and a beverage in the Bistro Bar at Courtyard Madison West/Middleton. - Sitel Technical Services, Inc. Put on your geek beanie and solve riddles to free the wizards and get the gift shop discount.